After wearing my fitness tracker for one full week I added up all my steps and divided by 7 to see the average daily steps I take (6,872). I knew that 10,00 a day was not a reasonable goal from there so I set a goal for adding just 500 steps to each day and set a goal of 7,372 per day. Once I am consistently reaching that I'll try and add another 500 and so on until I reach 10,000 day. 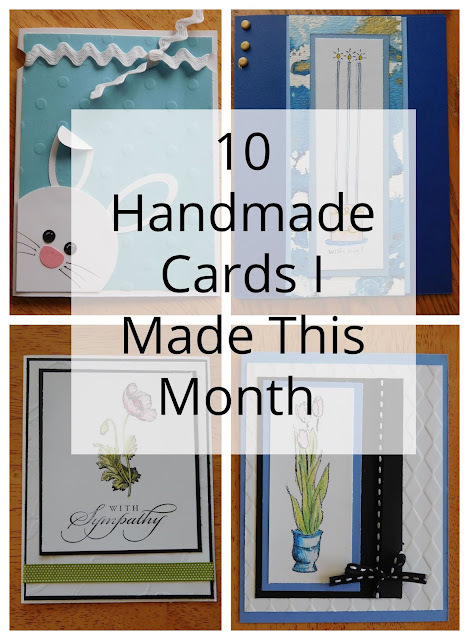 I might not reach my goal everyday but I'd like to try! Part of that might be that my fitness tracker doesn't seem to register activities like Pilates, yoga, and stability ball (three exercises I actually enjoy and use fairly regularly). But that's Ok because I know this measure is an approximate. I am also trying to make it a goal of mine to drink a minimum of 63 ounces water each day-- something I'm pretty sure I did each and every day these past two weeks (though I must get better at tracking that on my WW app). 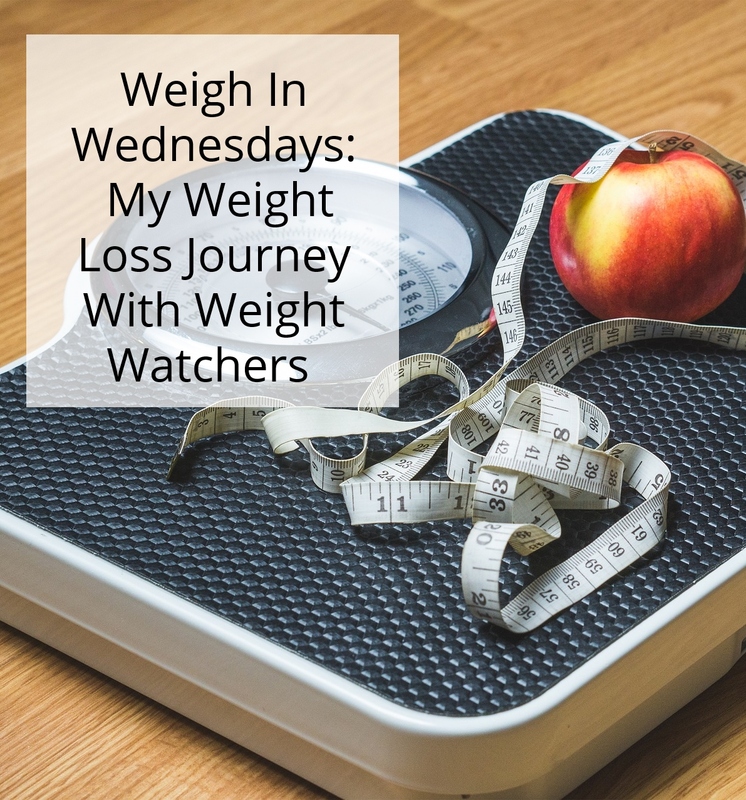 Wednesday April 3rd: I weighed in for another .4 loss bringing my total loss to 3.8 lbs in just under two weeks! I made another Blue Dot Day too! Breakfast: Yogurt parfait (3 pts-- I was able to knock one point off by switching out my granola for a different brand), water, vitamins (1 pt). Lunch: Tuna sandwich (low cal. oatmeal bread, laughing cow cheese spread, 1/2 can tuna mixed with 1 1/2 Tbsp mayo-- 5pts!). It felt great to eat an actual sandwich and I served it up with carrot sticks, cucumber slices, and tomatoes. I splurged with a 32 ounce bottle Crystal Light iced tea (1 pt) & 2 Dove chocolates (4 pts.). 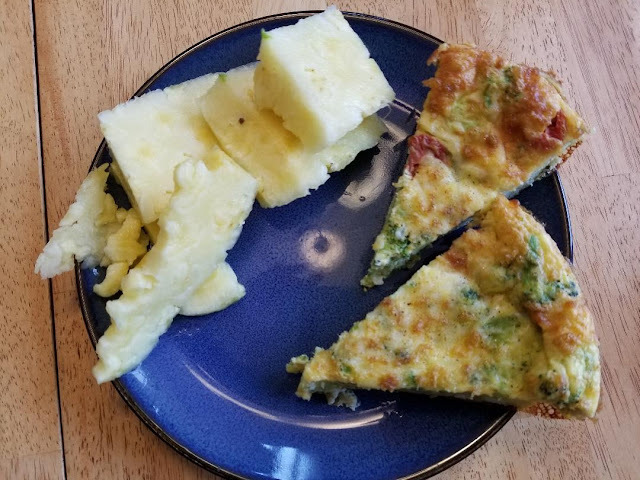 Snack: Crustless quiche left over from dinner (1pt) with pineapple. Dinner: 2 Chicken breast tenderloins, whole kernel corn, 1/2 cup couscous (4 pts) with a bit of Brummel and Brown yogurt spread (1 pt). Exercise: 30 minute stability ball and light hand weight DVD, 48 Min. hike with the boys at the Thompson Dam. 11,662 steps! Thursday April 4th: I managed to have a Blue Dot Day even while enjoying a freshly baked cinnamon bun. Breakfast: Yogurt Parfait (3pts), gummy vitamins (1 pt), and 16 ounces water. Lunch: Fresh made cinnamon bun (11 pts), fruit salad with watermelon, grapes, pineapple, and berries. Snacks: 32 ounces water, bagel thin (3 pts), Laughing cow cheese wedge (1pt), 2 hard boiled eggs, zesty ranch garden veggie straws (4pts). Dinner: Balsamic chicken with mushrooms (2pts), green beans, salad, and sugar free raspberry dressing (0 points!). Exercise: 30 minutes Pilates on the stability ball, carrying wood and raking for 30 minutes. 3,627 steps-- I knew I would not meet my goal for the day and I was fine. I was taking it slow on purpose after suffering from sore muscles. Saturday April 6th-- Blue dot day! 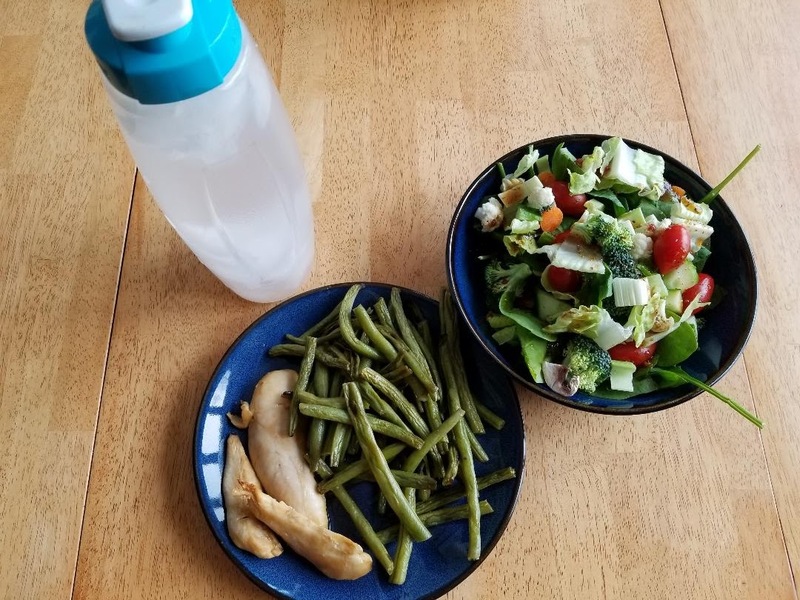 Breakfast: Yogurt parfait (4 pts), water, gummy vitamins (1pt) Lunch: Leftover chicken alfredo from dinner the night before (6 pts) zesty ranch veggie stick (3 pts), 32 ounces crystal light iced tea (1pt) Dinner: Pizza casserole (with a few modifications (8pts), salad, and dressing (1 pt). 2 Dove chocolate squares (4pts). Snack: 32 ounces water, pineapple, fit and light string cheese (1 pt), baby carrots, cucumber, tomatoes, chicken breast. Exercise: We helped my husband moving around scrap steel at his work for a good 40 minutes (which I logged as carrying wood since stacking steel is not an option). I also went for a walk in the afternoon for a good 20 minutes. 8,191 steps. The pizza casserole was loved even by my sons! Sunday April 7th-- Weighed in for another .6 loss-- that's 5.8 lbs! Here's hoping I can loose another .2 by my Wednesday weigh in and make it an even 6lbs. Blue Dot Day! (this makes 7 blue dot days in a row!!) 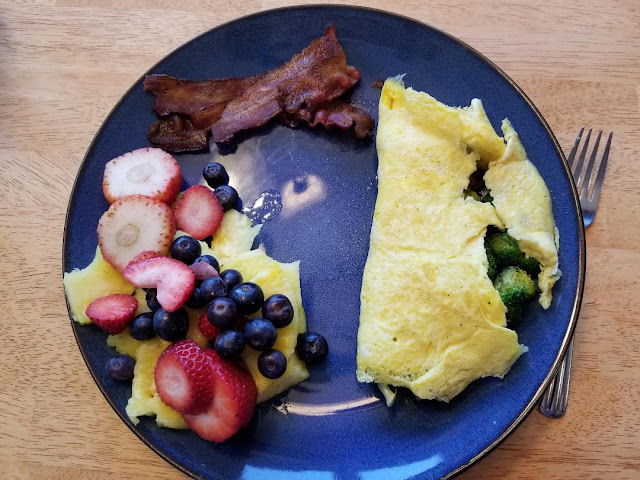 Breakfast: My husband made me a 2 egg omelets with fresh vegetables and a light string cheese stick (1 pt), fresh fruit salad, gummy vitamins (1 pt), 2 slices bacon (3 pts) Lunch: Leftover pizza casserole from last nigh (slightly more than 1 serving-- 9pts). Dinner: boiled shrimp, roasted vegetables, salad and salad dressing (1pt), 2 Dove chocolate squares (4 pts). Snack: One protein bar (6pts), apple, baby carrots, and light popcorn (3pts). Exercise: We went on a 30 minute bike ride (our first from last summer and wow! did that feel like a tough workout). 5,641 steps. Tuesday April 9th-- Blue Dot day! Breakfast: Bagel thin (3pts), laughing cow cheese (1 pt), 2 hard boiled eggs, apple, gummy vitamins (1 pt), water. 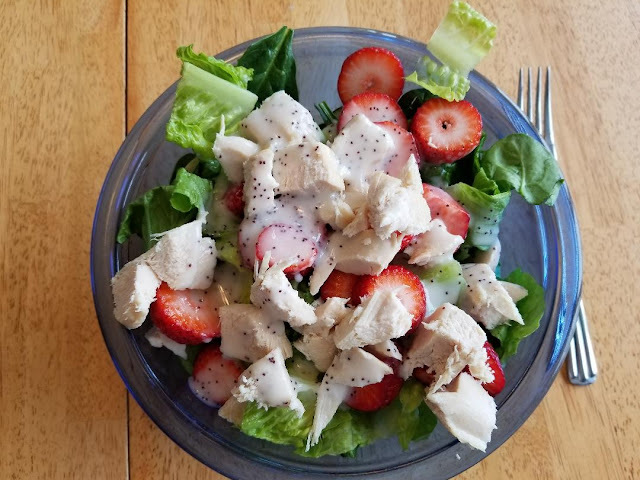 Lunch: great big salad with strawberries and chicken and sugar free poppy seed dressing-- zero! pointes. Dinner: 1 chicken sausage link (4pts), no sugar added spaghetti sauce (1 pt), spaghetti squash, 1 tablespoon parmesan cheese (1 pt), salad, dressing (1 pt). Snack: yogurt parfait (4 pts), Crystal light iced tea (1 pt), One protein bar (6pts) Exercise: I did some Pilates on the stability ball for 30 minutes. Ian, Evan and I went on a 60 minute walk to the state park and back in the afternoon. 9,516 steps. Thursday April 11th-- I used too few points for a blue dot day! I wasn't hungry and didn't each much after dinner I still had 13 points remaining. Breakfast: bran flakes (4 pts), strawberries, 1/2 cup unsweetened almond milk, gummy vitamins (1 pt), Lunch: leftover turkey and squash, Dinner: Turkey wrap (wrap 2 pts, light mayo 1 pt. 1/2 slice cheese 2 pt),fruit salad, and salad with poppy seed dressing. Snack: Exercise: Hour hike at purgatory chasm. 8,949 steps. Friday April 12th-- I knew by lunchtime it would not be a Blue Dot Day as we planned a date night! That's totally worth using those weekly points... and yet I was wrong; even with dinner out it was a Blue Dot Day! Breakfast: was the same as yesterday but I had my fruit on the side and added in a few pineapples and blueberries. (5pts) Lunch: Leftover meatloaf 1 1/2 slices (8 pts), salad, skinny girl dressing and mixed vegetables. 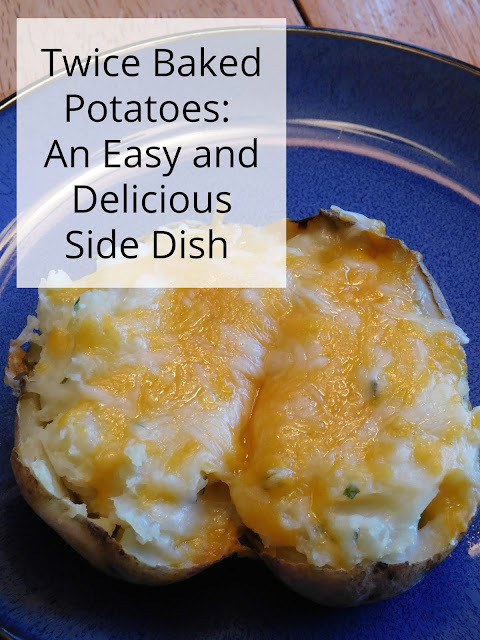 Dinner: We went to the Whistle Stop and I had baked haddock, plain baked potato and zucchini with water (since it's not a chain restaurant I had to guess at the point value of the meal and gauged it to be about 13). Snack: Raw veggies with yogurt dip (1pt). Exercise: Our hiking trip was canceled and I decided to forgo any other exercises. Exercise: I decided to skip my workout since I was pretty sore and our hiking group activity was canceled. 5,717 steps. Saturday April 13th-- Blue Dot Day! Breakfast: I had a 2 ingredient bagel (2 points), with some fresh fruit and hard boiled eggs. Lunch: I experimented with making a low point turkey pot pie for our weekly lunches and tried that for lunch today at only 3 points it was delicious! (I'll be sharing the recipe next Sunday the 27th so be sure to come back and look for it!) Dinner: Herb crusted pork tenderloin (2 pts), with zucchini and mushrooms, salad, and Skinny Girl dressing. Snack: broccoli, carrots, ranch dressing (3 pts), apple, Veggie Stix (4 pts), and 5 pieces of Dove chocolate (11 pts! )Exercise: I did hit the treadmill for a brisk 30 minute walk in the late afternoon but noticed my fitness tracker hardly counted any steps... 4,859 steps. Sunday April 14th-- Blue Dot Day! 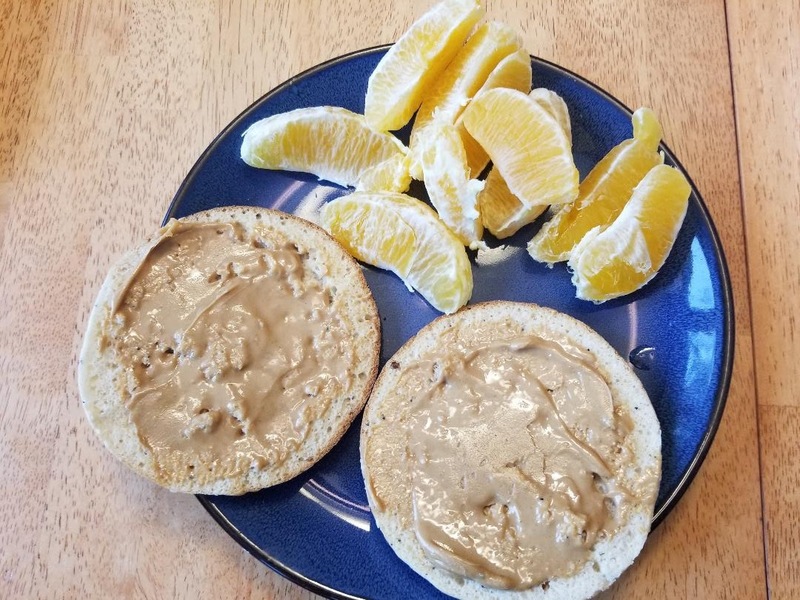 Breakfast: 2 ingredient bagel (2 pts), Brummel and brown spread (1 pt), vitamins (1 pt), orange. Lunch: Leftover turkey pot pie (3pts). Dinner: Pretzel crusted chicken tenderloins (2 pts), green beans, salad, and Skinny Girl salad dressing. Snacks: Veggie Stix (4 pts), carrots, 1/2 cup cottage cheese (2 pts), melba toast (3 pieces), 3 Dove chocolate pieces (6 pts). Exercise: 50 minute hike while trying to find some letterboxes with the boys. 8,875 steps. 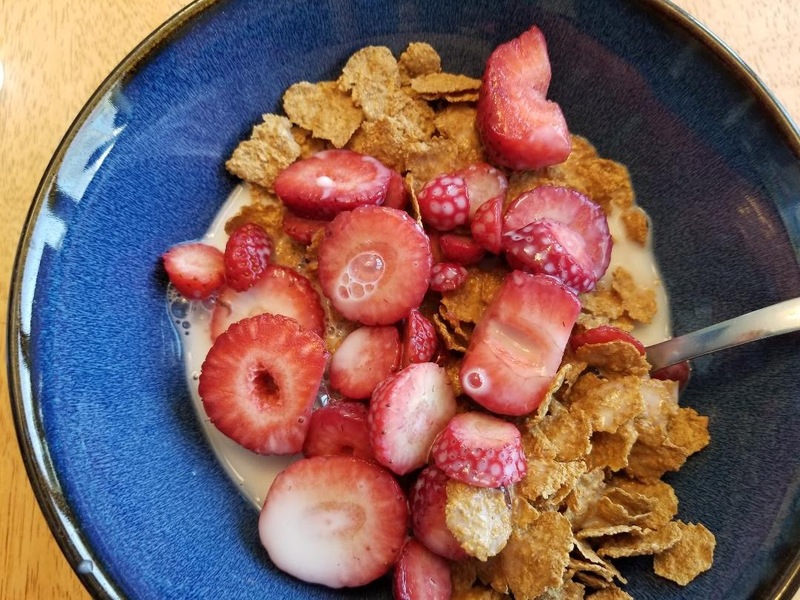 Tuesday April 16th-- Breakfast: Yogurt parfait (3 pts) , Vitamins (1 pt) Lunch: PB&J sandwich (7 pts) with an apple Dinner: Balsamic pot roast (8 pts), asparagus, butternut squash, salad and dressing. Snacks: Crystal light iced tea (1 pt), Quest protein bar (4 pts) Exercise: An hour long walk with friends at the Thompson Dam. As of dinner time I had 9,001 steps. I only didn't make my steps goal a few times these past 13 days and other times I blew that goal right out of the water! If I average out my steps I did make my step goal and surpassed it just a tad. I'm pretty proud of that. I weigh myself too often and I see those little fluctuations. I find that if I wait to weigh in after I drink at least a cup (and go to the bathroom!) I weigh less! Yeah, I think those fluctuations are normal but they can be frustrating at times. I only weigh in on Saturday mornings because my weight is ALL over the place, so maybe if you did that it wouldn't be frustrating seeing the fluctuations? I am on low-carb now and exercising four days a week and some days it seems like I am gaining and not losing! But I am hanging in there as well because summer is around the corner. Yeah, I really need to only weight myself once a week but a 30+ year habit of weighing myself every day is so hard to break! I saw almost a full pound gained back but knew I was eating right and exercising and if I only go by my week to week progress it is steadily going down. I just have to either step away from the scale or know that slight fluctuations are going to happen and I just have to keep doing what I'm doing and know the results will follow. I think you are doing great! All that food looks so yummy! After my cruise, I am going back to being plant based so I feel better and lose a little weight also. Chris is doing it now and has lost 35 pounds since January! Men! Thank you! My husband started WW a full week after I did and he's already lost most more than me and each day he kind of complains that he has so many points left to "use up" before bed.. and I'm like.. "I was out of points by lunch!" Must be nice to have a high metabolism! You're doing great! Still impressed with your tracking! Congratulations on your success with Weight Watchers. All the food looks so yummy - real food! You are doing great. I recently had to switch to a low saturated fat diet for cholesterol issues. It's hard and takes discipline, but like you, I feel the results are worth it. Thank you! Best of luck to you with your new lifestyle changes. Long term changes can be tricky but worth it in the end. Don't forget that if you are excersing you might be gaining muscle weight. I would take into account how your clothes fit too. Your meals look awesome so keep on going! Thanks! I am only just in the last few days noticing a slight difference in how my clothes fit... that is a huge motivator. All this food looks so delicious and healthy!